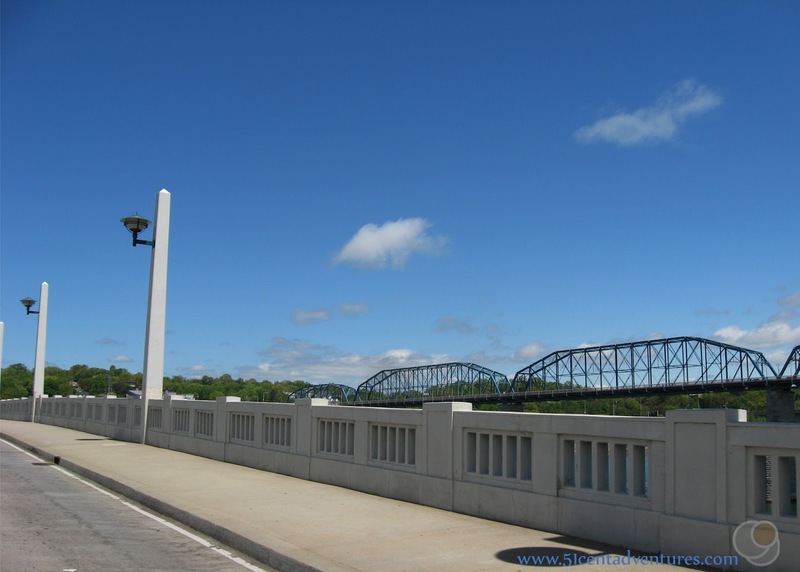 Location: The bridge originates at the intersection of 1st Street and Walnut Street on the Downtown side of the bridge and the intersection of Frazier Ave and Forest Ave on the North Shore side. This was the second stop of the second day of our road trip to the Lookout Mountain area of Alabama in April of 2016. 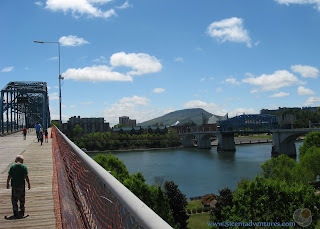 My family finished our amazing cave tour at Ruby Falls, and then decided to see what we could discover in downtown Chattanooga, Tennessee which was less than 5 miles away. I hadn't realized how close to Chattanooga and Ruby Falls are located to eachother. So I hadn't done much research about things to do in Chattanooga. A few days before our trip. I'd tried googling "Free things to do in Chattanooga," but nothing caught my eye. And anyone I talked to about the area always recommended either Rock City or the Aquarium. Both of which I decided were too expensive. So I didn't even plan for us to spend much time in the city. 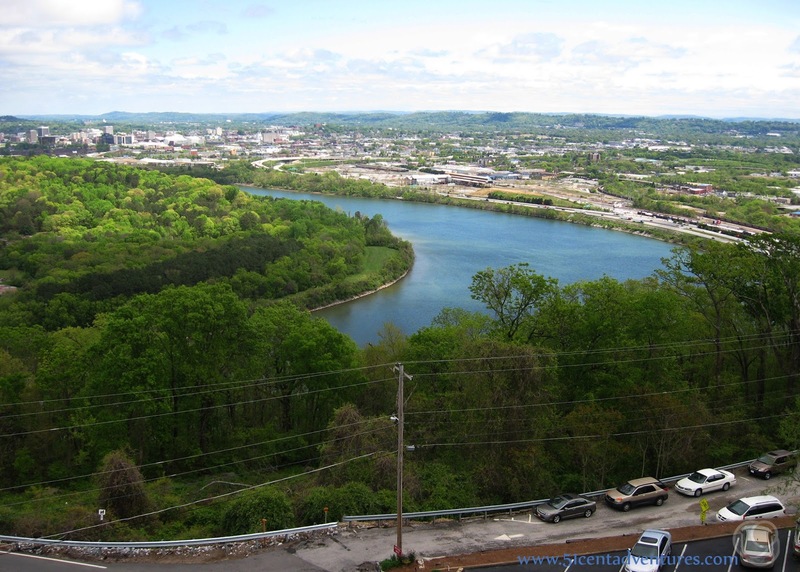 However, after our Ruby Falls tour we were able to look out over the Tennessee River Valley and get our first look at Chattanooga. The area was so pretty and the city looked so inviting that my husband and I decided that we had to see it up close. We decided to at least drive through the downtown area. 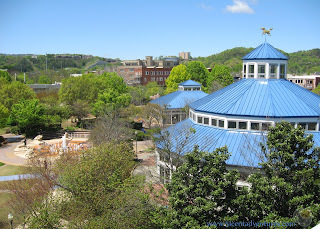 We drove around downtown Chattanooga and discovered that it was a very nice looking city. However, there didn't seem to be anything that our four young children would enjoy. I figured that since it was so close to a river there might be a Riverwalk area so we went that direction. We decided to drive over the Tennessee River before heading back toward Lookout Mountain. 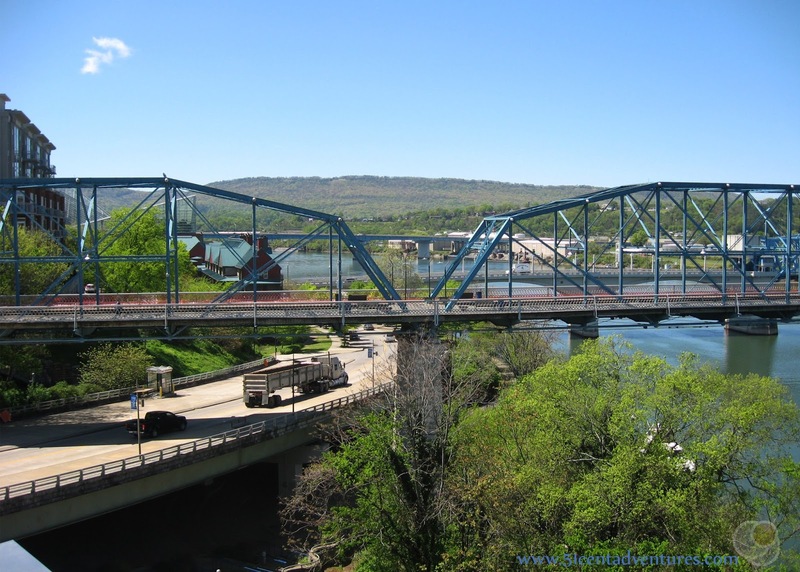 As we drove over the river I looked to the east and noticed a large bridge spanning the river. There appeared to be people walking on the bridge. 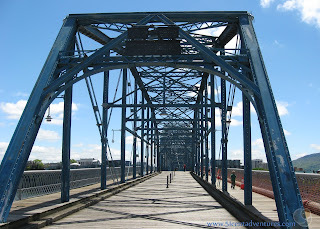 If you are familiar with this blog then you know what happened next - we just can't resist bridges. We parked in a free one hour parking spot in the North Shore area and walked over to the bridge. As we walked to the bridge we passed trendy little shops along Frazier street. 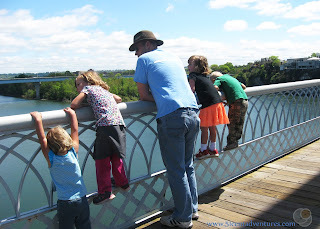 When we started crossing the bridge we could see a park down below the bridge. We could have parked near Coolidge Park at the Theater Center Parking lot. It would have cost $2 for up to 2 hours, $4 for up to 4 hours or $5 for over 4 hours. In retrospect, this would have been a great place to park if we'd been planning to spend more than an hour in this area. As we crossed the bridge we had a great view of Lookout Mountain. It was kind of surreal to think that we'd been deep inside that mountain just a few hours before. I didn't know it at the time, but the Walnut Street Bridge is the longest pedestrian bridge in the world. It is 2,376 feet long long and was built in 1891 to connect the North Shore to downtown Chattanooga. The bridge was used for decades before it was closed in 1978. It sat in disrepair for several years and was scheduled for demolition. However, visionary citizens saved the bridge and turned it into a historical landmark and a beautiful pedestrian bridge. 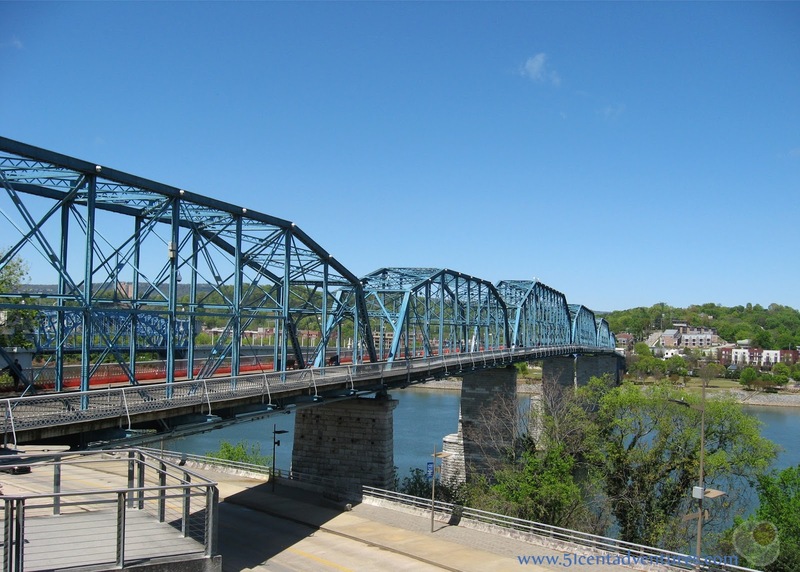 The bridge reopened in 1993 and help usher in a era of revitalization for the city. 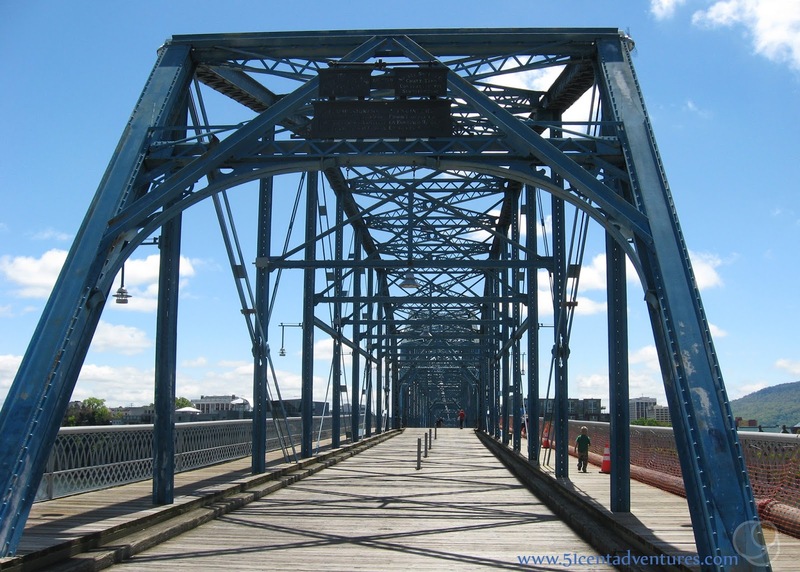 Read more about the history of the bridge here. 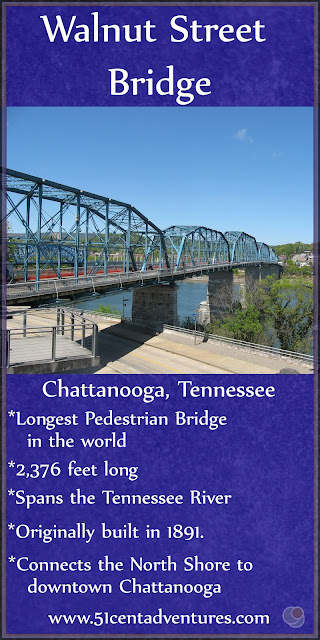 I'm so glad the bridge was restored because walking across the bridge gave my family a great view of the Tennessee River and of Chattanooga that we wouldn't have had otherwise. As we walked we also got a great view of the Hunter Museum of American Art building built on the banks of the river. The building itself was an impressive piece of art. When we reached the downtown side of the bridge we had many choices of which way to go to explore the city more. We didn't have much time, so we decided that we'd just take a closer look at the art museum before going back to our car. Reaching the museum required walking over another bridge that spanned Riverfront Parkway. 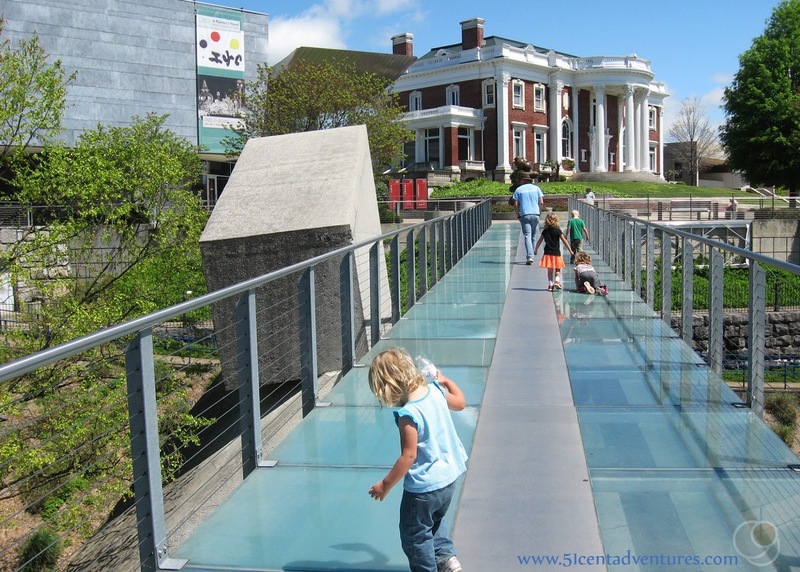 This bridge was very scary because the walkway was made of transparent panels that allowed us to see the road underneath. As soon as my two year old walked onto the bridge she said,, "Oh No!" and refused to move. I had to move her over to the solid middle part before she would walk again. After everyone was safely across, we walked around the front of the museum and checked out some of the statues that were on display there. Admission to the actual museum costs $15 for an adult ticket and is free for children under 17. The museum is also free for active military personal and their dependents. So we could have checked out the museum, but we were pretty certain our kids wouldn't enjoy it. We could have walked down a really inviting switch-back path to reach the Riverwalk on this side of the bridge. But we were running out of time on our free parking spot. Also I didn't think the kids had enough energy to make it back up that path, and then back across the bridge. This walk seemed to take a lot longer since most of the kids were getting tired. They all wanted to be carried, but since they outnumber my husband and I that wasn't an option. I switched off carrying the youngest two. This picture pretty accurately sums up my life. We made it back across the bridge and to our car just before our hour was up. It was also just before the kids used their last bits of energy for the morning. We got them into their car seats and most of them were asleep within minutes. 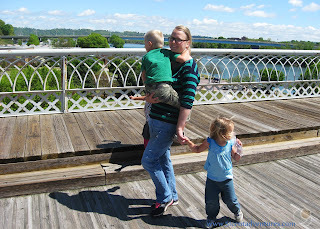 Since the kids were asleep that meant, unfortunately, we were done with any in depth exploring of Chattanooga. We decided to head back to Lookout Mountain, and drive back to our campsite at DeSoto State Park via the Lookout Mountain Parkway. 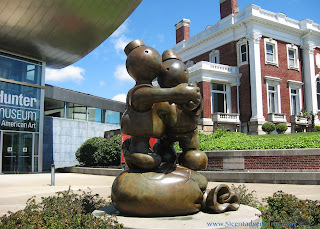 I hope to make it back to Chattanooga again before we leave the south. The city had an unique energy. Everything felt alive. 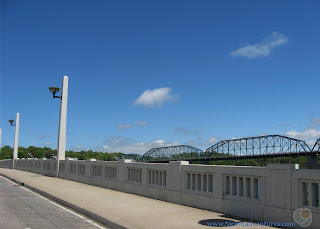 I'd love to spend time in Coolidge Park on the North Shore and explore the Riverwalk on the Downtown side of the river. And who knows, I might drag my kids into the Hunter Museum of American Art. I probably never would have known those places existed if it hadn't been for the Walnut Street Bridge. Recommendation: If you are looking for something free and outdoorsy to do in Chattanooga, then make sure to check out the Walnut Street Bridge. 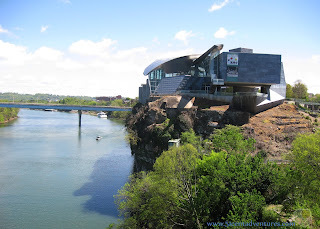 Also plan some time to check out the interesting things that surround the bridge. Directions: We accessed the bridge from the North Shore side at the intersection for Frazier Ave and Forest Ave. We parked in free one hour parking on a side street, but in retrospect it would have been a good idea to pay a few dollars to park in the Theater Center Parking lot next to the bridge. This would have given us more time to explore the area. 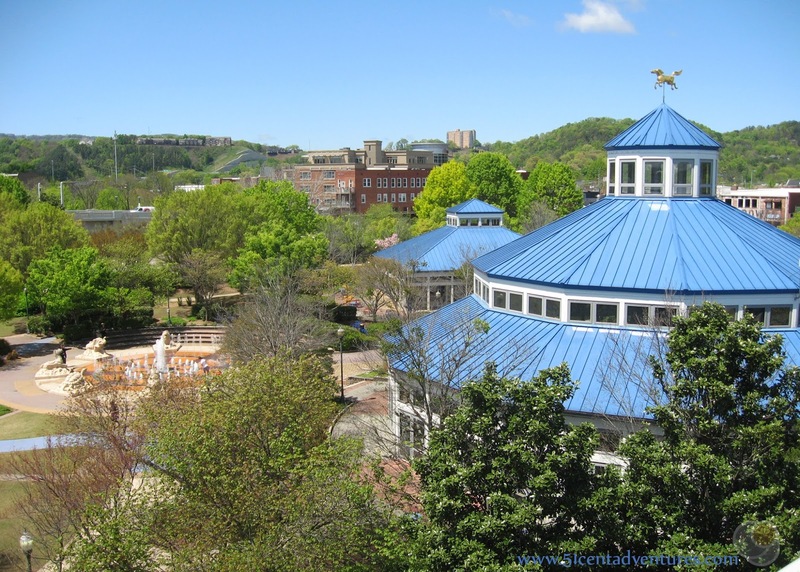 Places Nearby: I found out later that there is an electric shuttle that is free in the downtown area of Chattanooga. This would have been nice if we'd planned to see many things within the city. You can look up schedules and routes at the CARTA website. Next Stop: We returned to DeSoto State Park via the Lookout Mountain Parkway so my next post will talk about what you can expect when you are travelling on the Parkway.